San Diego International Airport in California has opened its new Terminal 2 Parking Plaza, offering an additional 1,700 close-in parking spaces to passengers. The Parking Plaza is designed to provide a fast, safe, and convenient traveler experience, with easy vehicle circulation and state-of-the-art parking guidance systems that will direct customers quickly to the nearest available open space. The three-story plaza is almost 1,000,000ft² (93,000m²) in total parking structure area, and has more than 2,900 parking spaces. The project also saw off-site improvements, including parking lot reconfigurations, utility relocations, and connection into the existing airport campus. “We understand that convenient, close-in airport parking is a core customer service need, and we address that need with this beautiful new facility,” said Kimberly Becker, president/CEO, San Diego International Airport. A design-build team comprising building company Swinerton, the San Diego County Regional Airport Authority, Watry Design and architecture firm Gensler delivered the new parking plaza, which will serve as one of the gateways to the airport. 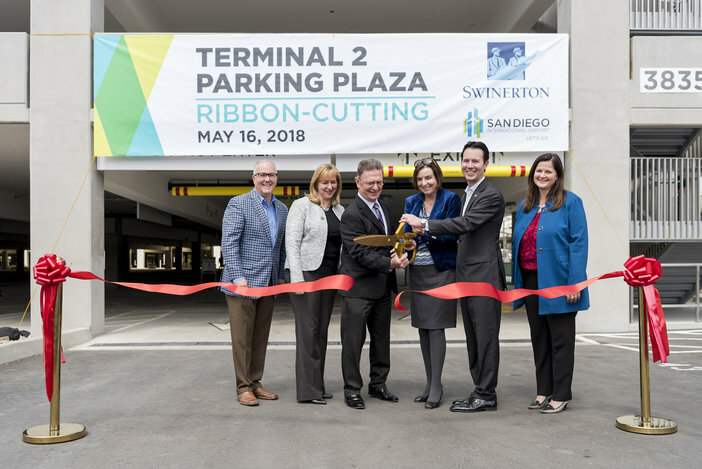 “Swinerton is proud to have completed the Terminal 2 Parking Plaza on time and under budget in a strong partnership with the San Diego International Airport,” said Chris Murphy, Swinerton project executive. The plaza is also environmentally sustainable, with extensive natural lighting, energy-efficient fixtures and a stormwater re-use system that captures and treats rainwater for use in the airport’s Central Utility Plant.